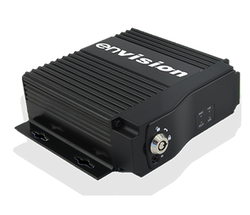 Envision Network Technologies Pvt.ltd, - Manufacturer of mobile dvr, ip camera products & analog camera products in Navi Mumbai, Maharashtra. IP camera is a networked digital video camera that transmits data over a Fast Ethernet link. IP cameras (also called “network cameras”) are most often used for IP surveillance, a digitized and networked version of closed-circuit television (CCTV).Remote administration from any location.
. The ability to easily send images and video anywhere with an Internet connection.
. Progressive scanning, which enables better quality images extracted from the video, especially for moving targets.
. Adjustable frame rates and resolution to meet specific needs. Bullet cameras are often used in outdoor surveillance systems & are built into a sealed weatherproof enclosure. They can be used indoors or outdoors without the need for additional hardware. Envision is a pioneer in the Designing and Manufacturing of CCTV products and ensure that customer gets great products at appropriate prices. An integral part of our DNA is creating long-lasting customer partnerships and working with them to identify their needs and provide solutions that support their success.